On Tuesday, the board will revisit the budgets for Green Communities work, the Open Space Commission, Youth and Family Services, and the Veteran’s Agent. But before I get into what’s still to be decided – I’ll cover what was approved. And before I do that, some more context is in order. Town Administrator Mark Purple referred to voters’ extreme generosity in 2017 as a main reason for a potentially over 6% tax increase. * (The new Public Safety Building project is responsible for a 2.62% increase.) There are additional factors at play, including a $1M decrease in state grants and a flat year for new business growth and other revenues. With some needed capital expenses again deferred, Treasurer Brian Ballantine warned that next year may be even worse. This year they started with an over 10% budget before whittling it down. If revenues don’t increase, the initial budget could start at a 13% increase. Ballantine was citing those numbers to push the board to deny additional funding requests for this year. Purple told the board if we don’t make the hard decisions now, they’re going to get harder. Selectman Dan Kolenda countered that may be reason to tackle some needed Capital Expenses or underfunded resources this year instead of pushing to a worse time. One of the increases recommended by the team this year was a $7,500 for an employee to manage the Green Energy Community grant work. The state grant has been funding projects that reduce energy waste and reduce the Town’s energy costs. But there is work involved in working with the state on the initiative, not covered in an employee’s job description. 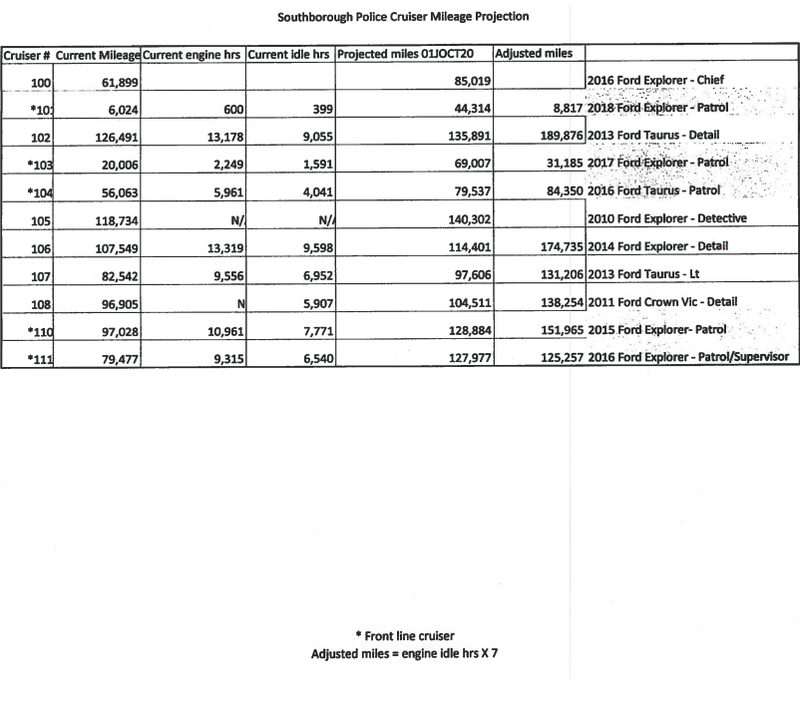 Since the grant value to Southborough may change in the future as more Town’s take advantage, Purple wanted to cover it as a stipend vs salary increase. Selectwoman Bonnie Phaneuf said she was nervous about making that change without looking at the employee’s job description. She pointed out that many jobs include “and all essential duties”. She asked to table that. The recommended budget presented to selectmen included a small decrease to the Veteran’s Agent budget. Upon questioning, Purple explained that it was due to reduced needs and that it had been approved by former agent John Wilson. Kolenda pointed out that needs can fluctuate. He asked if the newly appointed agent had approved. Purple promised to check in with him. At Kolenda’s request that item was held for discussion this week. Bonnie Phaneuf had missed the beginning of the presentation. She asked to meet with Freddie and revisit the ask this week. SYFS presented that it has been overwhelmed by the community’s needs. One of the recent need increases is residents who need counseling that have insurance but are waitlisted to get services. Director Sarah Cassell said that no teen struggling with suicidal thoughts should have to wait months to see a counselor. The department is also dealing with impacts from the opiod crisis. The department worked out a 5 year plan to get to where it needs to be. One of the changes for next year was turning a part-time position into a full time one. With benefits the change would add $60K to the budget. Purple worried that the increase wasn’t sustainable. Kolenda said they had been underfunded too long. Selectman Brian Shea agreed. 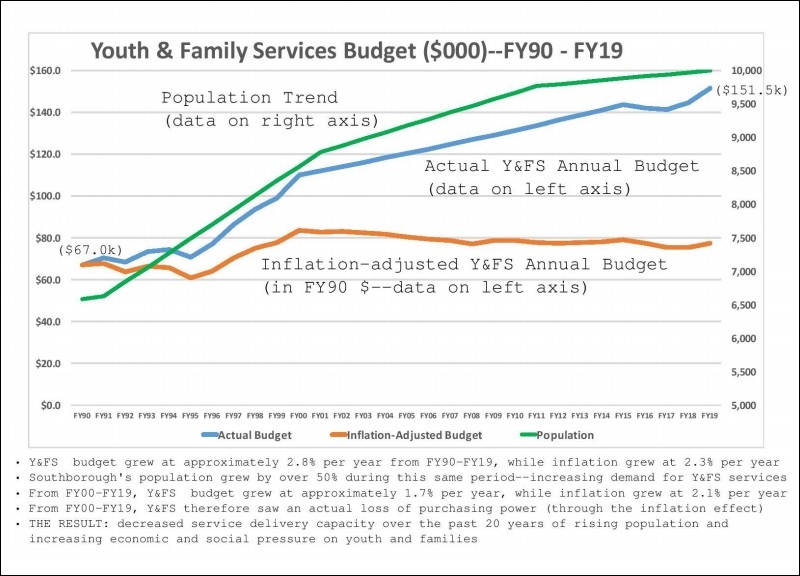 Pointing to a graph presented by SYFS showing the difference between the community’s growth and its inflation adjusted budget over 20 years, he said that wasn’t sustainable. Chair Lisa Braccio said she appreciates there is a need. But she also gets the phone calls from people telling her that they can’t afford their current tax bills. Combined with the Police Cruiser, this would add another $25 to the average bill. She and Phaneuf leaned towards adding part time help at a lower cost without benefits. With the board split, they opted to hold off until Tuesday when they may have a fifth member to break the tie. The Board was updated on the situation with the Economic Development Coordinator. The Economic Development Committee was continuing to pursue options including re-posting the job. EDC Members said they would prefer to make it more attractive by turning it into a full time job split with another group. One option would be to combine it with a position under the Zoning Board of Appeals. Selectmen disliked additional $20K in benefits that came with that. And they worried about potential conflicts between EDC and the ZBA. EDC members seemed to prefer sharing a dedicated Economic Development person with the Town of Millis. But that would still add $10K for split benefits. The committee is also still looking into contract agency options. But EDC members said the higher rate of contract work means only getting 10 hours per week of work vs the 19.5 hours that had been approved by Town Meeting voters. Selectmen are sticking with the lower budget and hoping the re-posting will work. Given that the length of time they had been looking, EDC members expressed skepticism. But they didn’t object. The MTC was founded to improve the Town’s technology efficiency and service to the community. To that end they want to conduct surveys about services the community wants, find out what other Towns do, and contract expert help for controversial 5G issues the Town will face. They asked for $5,000. Purple had recommended keeping them at $0. Since the committee was formed by a Town Meeting vote which authorized a budget, Kolenda argued that some kind of budget should be authorized even if small. Selectmen agreed to budget $1,000 for FY20. Paulhus said that Glock pistols budgeted to be replaced could wait. He would defer that to offset part of the cost along with $5,000 of his budget increase. (That brought the $48,764 request down to an additional $35,957.) Looking at the number of aging vehicles in the fleet, selectmen agreed not to push off the expense. Planning Chair Don Morris said that 90% his budget is for the Planning Department’s salary. Given the required annual salary adjustment, the 0.15% increase recommended by the Admin/Finance team represented a decrease to the board’s spending ability. Morris also pointed out that initiatives next year include a once every ten year’s project – the Master Plan. Morris was asked if he could use some of the savings from staffing changes this year to pay for contracts this year that he had planned for next. The Chair responded that he had been told that any contracts had to be completed in the same fiscal year. Accountant Heidi Kreiger clarified that Planning can’t execute contracts on the last day of a fiscal year since work is clearly intended to be done in the next fiscal year. But they can execute contracts this spring under this fiscal year budget with bulk of the work done this year that finish out in the next fiscal year. Morris asked to keep his budget ($6,000 higher than Purple’s version), for now. He said that they may reduce the ask at Town Meeting if they find they won’t need it all. I had previously shared that the Historical Commission was asking for more money. To clarify, they were asking for more than was in the presented budget. But that budget represents a $1,000 cut from this year’s $3,500 funding level. The Commission asked to reduce that cut to $500. With no representatives attending on Thursday to make their case selectmen supported the Admin/Finance team’s recommendation to cut the full $1,000. *Ballantine started the presentation with an adjusted budget showing a 5.99% increase. (Thanks to a project switch decided with Facilities and the Library Director, they were able to lower the Capital Expense request by $60k from the version that was posted in the pre-meeting packet.) That was before selectmen agreed to increase the budget by a combined $42,957 for MTC, Police, and Planning budgets. That adds more than 0.1% to the budget. A few decisions still tabled could raise that figure more. On the other hand, one could lower it a little, and Planning and the Regional School Committee budgets might also go down a little by Town meeting. Updated (1/15/19 8:37 am): Historical’s Treasurer Kate Battles pointed out that my original wording was misleading. I had indicated that the commission was seeking more funds. It would have been more accurate to say they were asking to reduce the budget cut being recommended. The Amin/Finance team’s budget calls for a $1,000 cut from the $3,500 budget. Historical’s Chair asked to raise that recommended budget by $500 to give them a $3,000 budget. Good morning, Beth! As the Treasurer of the Historical Commission, I would like to make a correction to your budget summary. The Historical Commission did not ask for an increase in our budget. Our budget was $3,500.00 last year and as we knew that the Town was facing fiscal constraints, we did not request an increase. Rather, when we learned that it was recommended that our budget be cut $1,000.00, which is roughly a third of our budget, we requested that only $500.00 be cut. What the BOS agreed to was the $1,000.00 cut. Thank you for your hard work. It is much appreciated. Thank you for clarifying. I meant that you asked for increased funding over the recommended budget by Admin/Finance. But I did not clarify (or realize/recall) that it was to lessen a cut being made from this year’s budget. Thank you for clarifying. I will update the post to make that clear. I just updated the previous post as well. It was less misleading – but it still wasn’t clear that unlike the other discrepencies – the Admin/Finance team’s recommendation was a cut to current funding levels. I just changed that to make it clear. Thank you again for reaching out and sorry for the initially misleading descriptions. Thank you very much for making these changes. It is much appreciated!